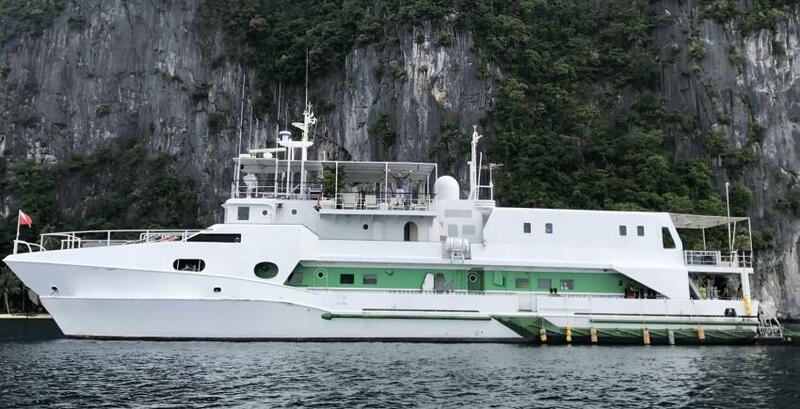 Stella Maris Explorer offers 1:1 guest to crew ratio. Nitrox is included in the price. Best Philippines diving destinations can be visited, including Tubbataha and Visayas. Excellent macro diving, amazing corals, healthy reefs. Stella Maris Explorer has enough of space to comfortably accommodate 20 passengers. Economy cabins located on the lower deck. This cabins can be shared, they have two single beds. On the main deck, Deluxe cabins are located. These rooms featured double beds. There are also 4 standard cabins on the upper deck. All Stella Maris staterooms are en-suite, has air conditioning. In between or after dives, boat passengers can stay in the lounge area. It's a perfect space to read a book, watch TV or DVD. Another space for relaxing on board Stella Maris is sun deck. Here you can enjoy the view or use a boat's jacuzzi. There is a full range of safety equipment on board: life vests, emergency rafts, first aid kit, firefighting equipment. Stella Maris Explorer itinerary consists of diving on Tubbataha reefs dive spots. Trip includes visiting of Delsan Wreck, famous for the big amount of fish, regularly spotted here, including some types of sharks. For example, white tip and black tip sharks are common for this area. While diving on Black Rock divers can see schools of surgeonfish, sweetlips, lobsters, and many others. Nurse sharks are often visiting this dive site. Washing Machine is another recognized dive spot of Tubbataha Reef. Colorful corals attract to this dive site sharks and barracudas, mantas and big Napoleon wrasses. Shallow reefs of Tubbataha features with big turtles. Tubbataha reef consists of a vast of soft and hard corals. Large sponges, anemones, gorgonian fans are home for numerous sea creatures. The diving season lasts on Tubbataha from March until June. This time brings the best visibility and the most comfortable water temperature that ranges from 26 to28C.